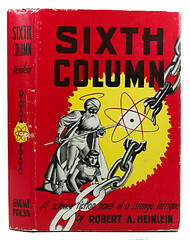 …a pic of the French edition for Sixth Column (a softcover with dj). It’s interesting because it was published in 1951 which makes it one of the first SF books published in France. It was released in a detective fiction collection and was – as far as I know- the first attempt for a mainstream publisher to publish a series of SF books. They also released Death’s Deputy by Hubbard and…stopped there. Good stuff, we can compare the two covers below. You can see a couple of flat-faced monkeys getting the death-ray treatment there from a Priest of Mota. Sterling use of the Ledbetter Effect. Check out the Review if you aren’t sure what I’m talking about. 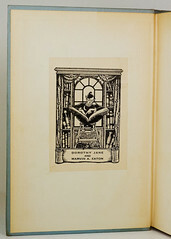 In addition, I mentioned a few days ago about him having a book with the same book plate as I have in one of mine. He sent me a pic of that as well. Mine is on the left, out of my copy of The Survivors by Tom Godwin. Christophe’s comes out of Robert Randall’s The Dawning Light. I know, I know… for all you know I could be pulling a fast one and they both could be out of the same book. Well, I can assure you they aren’t. It’s a small world in Gnome Press collecting circles. This entry was posted on April 2, 2009 at 6:39 am and is filed under Comparisons with tags Sixth Column, The Dawning Light, The Survivors. You can follow any responses to this entry through the RSS 2.0 feed. You can leave a response, or trackback from your own site.